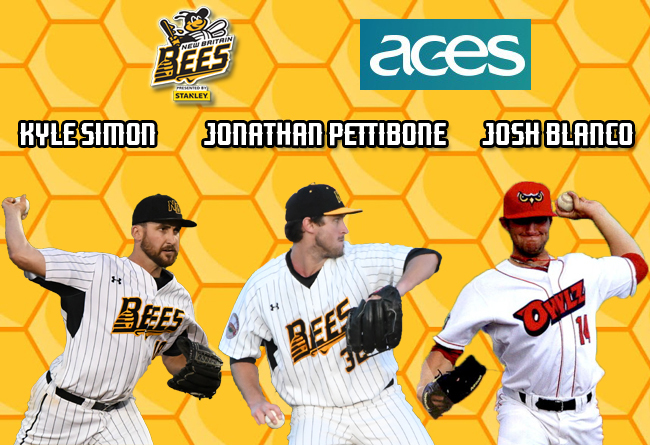 (New Britain, Conn., March 13, 2018) – The New Britain Bees today announced the signings of pitchers Kyle Simon, Jonathan Pettibone, and Josh Blanco. Kyle Simon returns to New Britain for his eighth season of professional baseball and fourth in the Atlantic League. Last year, the righthander made 28 appearances (23 starts) for the Bees, posting a 12-11 record with a 3.95 ERA, 91 strikeouts, six complete games, and one shutout over the course of 171.0 innings pitched. The 27-year-old was originally drafted by the Baltimore Orioles in the fourth round of the 2011 MLB amateur draft. He spent one season in the Orioles farm system, before being traded to the Philadelphia Phillies with Gabriel Lino in exchange for future Hall-of-Famer Jim Thome in 2012. Simon played three years with the Phillies organization, reaching as high as the Triple-A level in 2014. He would then make his Atlantic League debut in 2015 with the Lancaster Barnstormers, followed by his Hardware City debut the following year. In 2016 with New Britain, the California-native was named to the Atlantic League All-Star Team while collecting an 8-6 record with a 2.77 ERA and 67 strikeouts in 120.1 innings or work. In 215 career minor league outings (58 starts), Kyle owns a 38-37 record with a 3.48 ERA, 352 strikeouts and 1.27 WHIP in 584.0 innings pitched. Jonathan Pettibone returns to New Britain for his ninth season of professional baseball and second in the Atlantic League. Last year with the Bees, the former big leaguer made 23 starts, logging 63 strikeouts over 102.2 innings of work. Pettibone was originally drafted by the Philadelphia Phillies in the third round of the 2008 MLB amateur draft. He made his way quickly through the Phillies organization, reaching the Major Leagues in 2013 at the age of 22. That year, the righthander was a staple in the Philadelphia rotation, starting 18 games, and collecting a 5-4 record with a 4.04 ERA and 66 strikeouts in 100.1 innings pitched. He would appear in the Majors again the following season before being sidelined with an injury, and would not pitch professionally until he made his Atlantic League debut with New Britain last year. The 27-year-old holds a record of 37-40 with a 3.76 ERA and 438 strikeouts over the course of 639.2 innings in 120 minor league appearances (118 starts). Josh Blanco joins the Bees for his eighth season of professional baseball and first in the Atlantic League, after being acquired in a trade with the Lincoln Saltdogs of the American Association. Last year, the lefthander appeared in 34 games for the Texas AirHogs of the American Association, collecting two wins, three saves, and 52 strikeouts in 39.0 innings of work. Blanco was originally drafted by the Los Angeles Angels of Anaheim in the sixth round of the 2008 MLB amateur draft. He spent three years in the Angels organization before making his Independent baseball debut with El Paso (American Association) in 2011. The Texas-native also spent time with the Ottawa Champions of the Can-Am League from 2015-16, having his contract purchased by the Texas Rangers and pitching in seven games for Single-A High Desert in 2016. The 28-year-old holds a record of 13-14 with a 4.33 ERA and 291 strikeouts over the course of 255.2 innings pitched in 138 minor league appearances.